Mumbai, April 12: He is all of 2, but Taimur Ali Khan is the cynosure of the Bollywood paparazzi's eyes. But when the photographers went clickety click on seeing him at the airport here recently, his father warned them off saying "the child will go blind". "Bas karo yaar, bachcha andha ho jaayega (Stop it, the child will go blind)," Saif told the media, eliciting laughter from some of them. 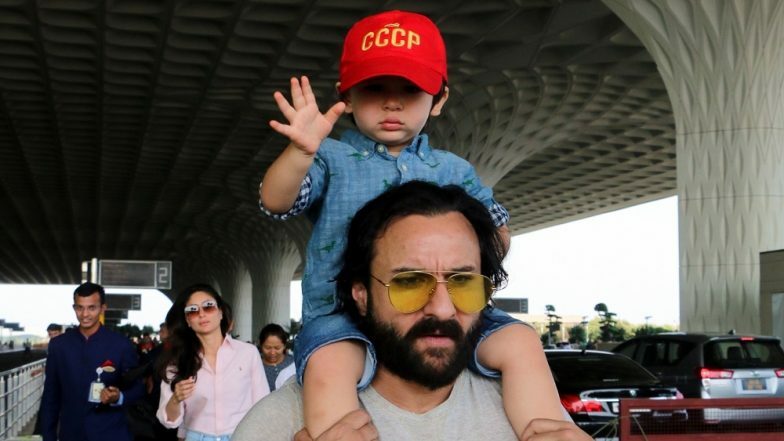 Taimur nonchalantly sat atop his father's shoulders, wearing a blue shirt, shorts and a red cap adding contrast to his look. He waved at the shutterbugs like he usually does when he gets all their attention. Accompanying them was Kareena Kapoor Khan, who looked casual but chic in a pair of bell bottom denims and a soft pink shirt to beat the summer heat. Taimur Ali Khan Can't Contain His Happiness As He Rushes To See What's In The Bag! (See Cute Pics and Videos). When the paparazzi urged the couple to pose, Saif promptly said: "Aap ko lena hai toh lo, ye pose karna thoda ajeeb hai (You want to take photos, you take them, it's weird to pose)." They were all heading to Pataudi, Saif's ancestral home.